Even though Egypt was considered a mostly peaceful place, it still had a well organised and disciplined army ready at hand should it have the need for war. Once Egypt was united by early wars to one kingdom it was then highly organised with a heirachy and chain of command that was highly advanced. The Majority of soliders were signed up without any real choice about becoming an Egyptian warrior. Lots of the army comprised of prisoners of war from previous skirmishes and battles. These men were trained in various battle skills that were considered by the king and the nobles to be important. Other Egyptian warriors signed up to the army of their own accord, a choice they wanted to make themselves. these included Upper class egytian civilians who were given good oppurtunity to become officers and to hone their warrior skills, leading the rest of the soldiers. The Egyptian army’s pride group were the true soldiers. These egyptian warriors were known as the “Braves of the King” and often led the most important battles and strategic attacks. Other specialist groups consisted of the Kings personal bodyguards who would accompany him on trips overseas and provide protection for his life. The purpose of war for these Egyptian warriors was to get what they called booty, treasure riches and ownership of the town or city that was conquered. Sometimes the prince or ruler of the city would swear the Egyptian king their ruler and they would be allowed to keep charge of their city with the ackknowledgement that Egypt was now its ruler. Egptian warriors in the infantry would often be armed with typical weapons of the time, from swords and shields to bows and arrow, to spears. 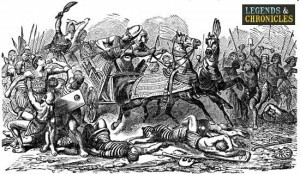 The chariot soldiers would be armed in a similar way but more likely to carry spears and bows as their main weapons due to the range advantage from the chariots.